Rear Brakes Single Ø220mm Brembo disc with twin-piston Brembo caliper. 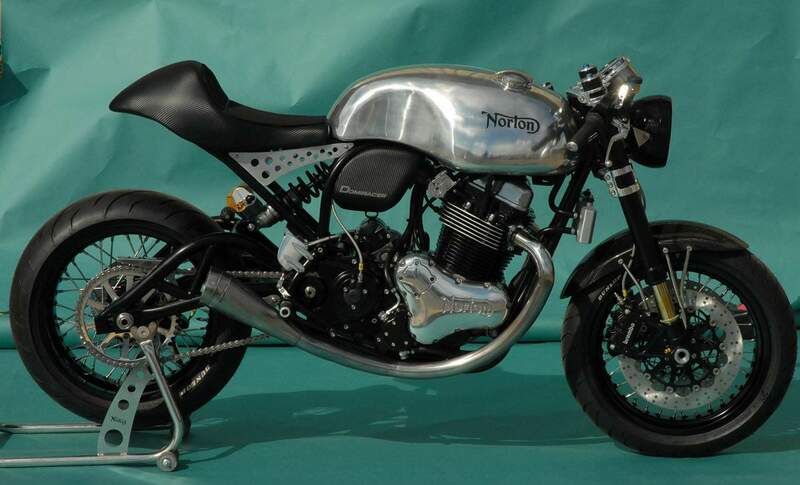 The Limited Edition Norton Domiracer. The Domiracer is built around the new 961cc Norton Commando engine and features a specially designed featherbed style tubular frame. The new bikes bodywork is made up of a lightweight carbon fibre seat, air box and front fender and a handmade aluminium tank gives it a distinct Cafe Racer style which was the exact intention. The Domiracer was designed to be a modern interpretation of Cafe Racer motorcycles and what better base to use than the modern interpretation of a Norton? 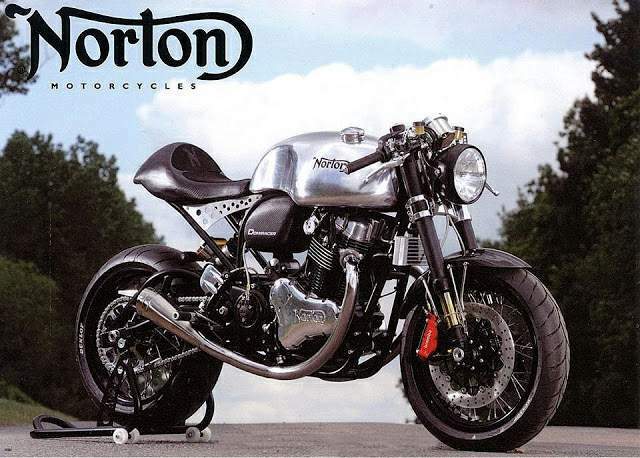 So the Norton Domiracer is a purpose built, high power, bare bones street racer but it has one small problem, it's not street legal. Let’s get the bad bits out of the way immediately: The cynic in me knows that, essentially, the Domiracer is ‘just’ a rehashed, 80-horsepower pushrod Twin. It comes with no modern, electronic trickery, is barely road legal, our test bike had a slight electric fault, there’s not much steering lock and, even if (unlike most of us) you can afford its £24 grand price (£26K if you want a road legal version), you can’t buy one anyway. The 50 examples being built have already been snapped up. But I don’t care about any of that. Having stood next to it, smitten by its sheer beauty and sublime detailing. Having been aurally assaulted by its cacophonous open exhaust. And having ridden it (all too briefly, mind, but still the first person in the world outside the factory to do so), I’m not ashamed to admit the ‘Domi’ has stolen a big chunk of my heart. But it’s not love we’re talking. Nothing so sweet and civilized – it’s sheer, animal, passionate LUST. I can’t think of any other machine of recent years that gives such an enormous sensory experience – and on so many levels. Actually, scratch that, there are two: Ducati’s full-blown, ultra-exotic and harmonic Panigale R, all £27 grand of it, and MV’s £19,999 F4 RR, both of which look good, sound good, ride good, too. But, on second thoughts, nah, I don’t want either of them as much as I want the Domi and can’t get as much out of them, either. Shortly after arriving at Norton’s sumptuous new HQ in the grounds of Donington Hall just outside Donington Park, photographer Ian Jubb and I were ushered through to the capacious, carpeted workshop where the gleaming Domiracer stood on its paddock stand, center stage. Even at silent standstill it’s a wonder. They say beauty is subjective, that it’s in the eye of the beholder, but the Domiracer is one of those rare exceptions: It’s unequivicably, unambiguously, no doubts, no questions stunning. Hand-in-hand with the modern monoshock is the cutting edge carbon fiber, lashings of CNC-milled-and-hand-polished alloy and top-spec, state-of-the-art cycle parts. Golden Ohlins and radial Brembos never fail to enamor. Here they’re the pearls and diamonds adorning Venus de Milo. Personally, I think they’ve got it spot on. The jewel in the crown is detailing and touches that take the Domiracer above merely a special-framed café racer with well-appointed suspension and brakes. The special, delectable milled and polished alloy top yoke and heel plates are the most obvious examples, but the whole bike’s littered with them. They’re also touches that take the Domiracer into true exotica territory. Being CNC-cut then hand-finished they’d be too expensive to produce for conventional mass manufacturers, yet impossible for specials builders, too. In short, the Domiracer, mouth-watering as it is, is the best demonstration yet of what Norton can do. And all of that’s before the thing’s even been fired up. But thumbing the open-megga-ed Domiracer into life was like opening a whole new dimension of sound and sensation, like Dorothy crossing the threshold from monochrome Kansas into Technicolor Oz. There’s not much point revving above five, but there’s lots of joy in just blipping and blipping. The whole aural experience is intoxicating and addictive – checkout the video and hear for yourself. This being the first completed example (hence the ‘No. 1’ sticker on the carbon airbox) it perhaps unsurprisingly is going to remain the property of Norton owner Stuart Garner himself. Which is why, leathered and helmeted, and astride the Domi ready to head out onto the road for the first time, it’s his parting words rather than the exhausts’ deafening thunder which were ringing in my ears the most. “If you crash it, don’t bother coming back!” I think he was joking. A handful of easy-enough clutch ,a prod down into the first of five ratios, a slight blip and clutch slip and we’re away, easy as pie. Within 200 yards I was out of the HQ’s grounds, onto the open road and starting to feed it revs and gears. Don’t get me wrong, there’s no performance revolution here. 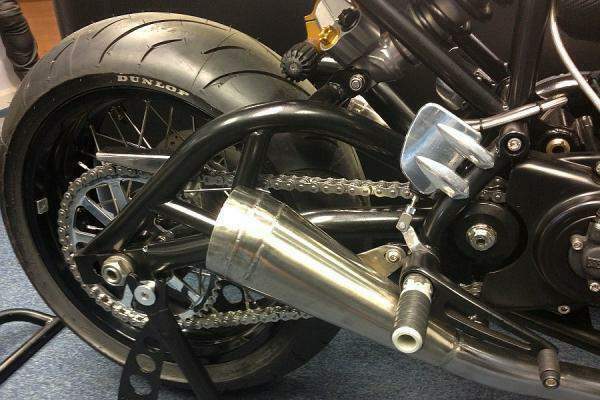 Norton’s pushrod Twin, despite what the fiercesome exhaust note may suggest, is no firebrand. Its 80-odd horses, progressive delivery and slightly clunky and sloppy, ‘old school’ nature reminds most of a worn, air-cooled, two-valve, Ducati L-Twin, so this baby’s not going topside of 125 mph any time soon. But it’s still enough to excite, please and, more importantly, invigorate. Best of all, it’s enough to let the real star turn of the whole plot – the Domi’s chassis – shine. To be honest, I hadn’t expected much of the new Featherbed, Ohlins or no, hadn’t really thought about it, even. I was too distratcted by the look and the loud. But after only briefly letting it stretch its legs into third then fourth gears on the Derbyshire A-roads the whole plot’s class was already shining through – a racer-ish firm but refined ride, utter stability, instinctive steering and quality brakes. We didn’t have much chance to push the Domi hard, of course. But that’s not really the point. Few will – or want to. But on our main photo corner – the one turn I did time after time, faster and faster – the Norton’s chassis was so calm and composed I’m sure it could’ve done it 30 mph faster without a flinch. And all to that wonderous cacophany bouncing off the farm walls and in the reflected gleaming glory of that ally tank. Some bike, this. New Nortons don’t come along very often, especially ones with featherbed frames and looks like this. That is enough, in itself, for the Domiracer to be considered special. The fact that its 83% British with much of it (frame, tank, pipes, engine and final assembly) all done on site at Donington, is another big plus. Then there’s the look (which makes the 961 now seem old hat), the wonderous noise, the quality and the components and the ride itself. Best of all, though, I reckon, is the price. For £24,000 you are getting something very special indeed. Or should that be were, ‘cos sadly they’re all snapped up already. I don’t blame those buyers one little bit. The Domiracer is a truly great bike – not great because of its abilities, dynamics or performance. Great because of the wonderously rich biking experience it delivers, Compared to this every modern superbike is flat, bland and sterile. The Domiracer, meanwhile, is one of my bikes of the year.